Do you live with your Gmail or Outlook windows open all day, and pick up your phone every time it buzzes with new mail? Do you find yourself switching to your inbox just to see if you have something new from… anybody? Are you proud of your sub-second response times to all missives sent to you? Well if this describes you, then STOP! Though it may seem counterintuitive, one of the best things you can do for yourself and for your customers is to not be an email junky and to take control of the medium. Email overload and its bigger brother, information overload, are both becoming very large problems in today’s knowledge worker society. In fact, it’s estimated that information overload cost the US economy almost $1 trillion in 2010. Other surveys have found that average knowledge workers will spend up to 28% of their day (and by some estimates even more) simply working on “email.” Add to that the very real but relatively unknown issue of technostress, or stress caused by being unable to cope with onslaught of information and tasks brought on by new technologies, and we have not only a fiscal problem but a health problem as well. Just as we know that sitting for long periods of time isn’t very good for us, we also know that drowning in email and information overload isn’t either: it leads to increased stress levels, decreased job satisfaction, higher turnover, and lower productivity. Guess what? If you are feeling these effects, you can change this. And believe it or not, you don’t need to reduce the amount of emails you receive, you don’t need to hire a virtual assistant or sign off the web entirely. In fact, just about all you do need to do is follow one simple guideline: check your email less frequently, and only at certain times of the day. First things first, you must turn off auto-notifications in whatever email application you are using. For instructions on how to do this in Outlook, see this video. If you are using Gmail, make sure you don’t leave your Gmail window open in your browser. On your phone, either turn off the automatically scheduled email check times, email push, or at least the buzz, sound, and badge notifications that are on by default. Why? Because being notified every single time you receive even the most mundane email is absolutely killer on your productivity. Each time you switch from working on something important to check that new email that just came in, it can take up to 24 minutes to regain full productivity at your primary task once you switch back. This is what psychologists term “task switching costs,” and even though you may feel like you are a multi-tasking master… well, I’m sorry to say that you’re not. Only about 1 to 2 percent of the population is actually capable of multi-tasking. The rest of us only switch quickly between multiple tasks in our head, but incur massive task switching costs, and therefore get even less done. Did you know that if you have a high dependency on email, going from checking it continuously (as most of us do) to checking it just eight times a day will lead to a 3x productivity gain in completing tasks? Can you imagine what that would do for you during the day, being able to get your primary work done three times faster? And checking email only four times a day yields even better results. This is exactly what researchers Gupta, Sharda, and Greve found, and that by checking email only four times a day you get the best balance of productivity improvements versus frequent checking. 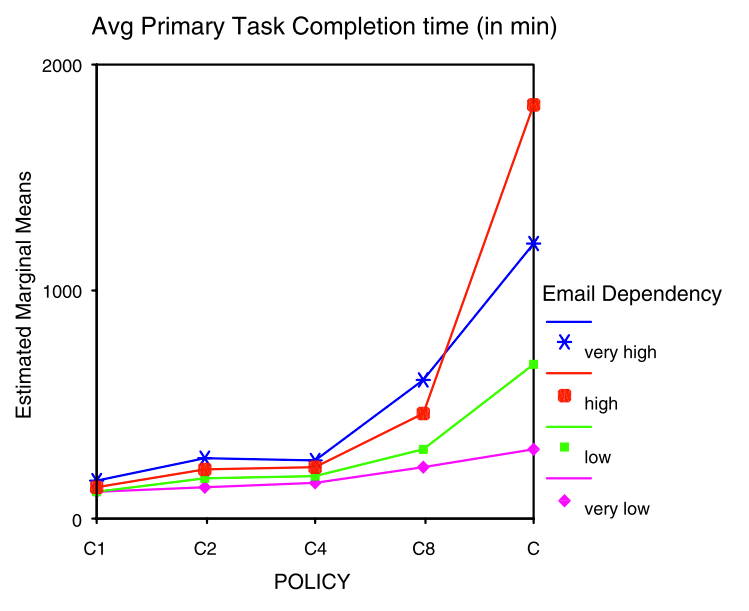 Time taken to complete a primary task (y-axis) given the number of times email is checked during a day (x-axis). From Gupta et. al. So what does that mean for you? Let’s say you start your work day at 8 AM and you finish around 5 PM. First of all, don’t check email on your phone right when you wake up! It’s become a habit to many people, but it doesn’t start you off on the right foot. Second, don’t check it right when you get to work–reserve that time, which is usually by human nature your most productive and creative of the day, for organizing yourself and getting your most critical tasks done. If you are going to be checking your email four times a day to boost productivity, then your first check will be at 9 AM. Open Gmail, Outlook, or whatever you may use, and grab all of your correspondence. Sort through the junk, notifications, and easy messages first, to get them out of the way. Then sit down and craft replies to the ones that need actual responses. Then turn off Gmail, Outlook, or what have you! You are not going to check your email until 11 AM now. Rinse and repeat at 1 PM, and again at 3 PM. When quitting time rolls around at 5, resist that urge to check your email “one last time,” because you will most likely not be able to provide very thorough responses to any issues raised at that time anyway, and it will simply delay you from getting on to other important things in life. To review, in order to boost productivity (measured in time taken to complete primary work tasks) by as much as a factor of three, you are only going to check and respond to emails at 9 AM, 11 AM, 1 PM, and 3 PM. “But what if someone has something urgent they need me to take care of at 10 AM?” Then they need a way to be able to reach you at that time, but it should not be through email. They should be able to reach you by phone, text, or walking over to your desk if you are co-locating, but email should not be the primary avenue for urgent matters. Communication on your part is huge here. People may be used to your previous behavior of always responding super quickly, even at 2:30 AM. You will need to communicate to them that you are changing your behavior in regards to email, but that you will be doing better work for them because of it. Let them know your schedule, and also give them a way to get a hold of you during non-checking times. An email signature is perfect for this sort of communication. Some techniques to avoiding email overload may seem straightforward, while others may seem counter-intuitive. Much of the theory behind how to avoid overloading on information, email, or any other form of new information inundation can be boiled down to an idea presented by Dr. David Levy: acceleration, which is what we are victims of more and more in this technical society, does not equate to increased productivity. While we may be completing more and more activities (ie, reading and answering emails), just getting more of this in does not mean we are being more productive, or producing more quality work. We have confused this at the basic level of society, and this is why we are now suffering the negative effects. If you can break yourself of the popular belief that by doing more you are doing better, then you can begin to examine what other areas of your life are ready to possibly be decelerated in order to be more worthwhile. You can do this! While it may seem scary to respond less frequently to email, your real work will improve, and your stress levels will decrease. Let others know what you are trying to do, and they will often go right along. If we all take just a step back, we will all take a couple steps forward as a more productive society. Joshua is a technology consultant working in Houston, TX, and is passionate about the problem of information overload. He blogs about the topic at joshualyman.com, as well as writing about entrepreneurship and technology topics. You can also follow him on Twitter @jlyman. Well, certainly an out of the block thinking but looks logical. I would try it myself once and if it really reaps me greater results, would surely recommend it to others. I have coached hundreds of executives over the years and the most important skill each one needs to develop is to learn to avoid distractions. Great tips! Without distractions, we would all be much more productive! Thanks for this post!! As a web marketer, this is a huge problem for me. Lately it’s turned into a monster where I feel my attention is always split (and I don’t think I’m in the 1-2% that multitasks effectively). I have e-mail pop-up notifications on my computer and always keep my e-mail open in a tab. To add to that, I also have push notifications on my phone for most of my social media channels. It seems so obvious to turn those off, but honestly, I’ve never consider it. Thanks so much for the pointers. Onward to more productive workdays & less distractions.